The role played by earth sciences in the scientific community has changed considerably during this century. Since the revolutionary discoveries of global processes such as plate tectonics, there has been an increasing awareness of just how fundamental many of the mechanisms which dominate in these processes depend on the physical properties of the materials of which the earth is made. One of the prime objectives of mineral sciences is now to understand and predict these properties in a truly quantitative manner. The macroscopic properties which are of most immediate interest in this context fall within the conventional definitions of thermodynamics, magnetism, elasticity, dielectric susceptibilities, conductivity etc. These properties reflect the microscopic contributions, at an atomistic level, of harmonic and anharmonic lattice vibrations, ionic and electronic transport as well as a great variety of ordering and clustering phenomena. The advances made by solid state physicists and chemists in defining the underlying phenomena lnvolved in the thermal evolution of materials have stimulated major new research initiatives within the Earth Sciences. Earth Scientists have combined to form active groups within the wider community of solid state and materials scientists working towards a better understanding of those physical processes which govern not only the behaviour of simple model compounds but also that of complex materials like minerals. Concomitant with this change in direction has come an increasing awareness of the need to use the typical working tools of other disciplines. Illustrations note XXIV, 707 p.
1. The Microscopic Mechanisms of Complex Structural Phase Transitions.- 1. Introductory remarks.- 2. Microscopic mechanisms.- 3. Computer modelling.- 4. The Landau free energy function.- 5. Critical fluctuations.- References.- 2. The Thermodynamics of Short Range Order.- 1. Introduction.- 2. Symmetry Principles for interactions in modulated structures.- 2.1 Symmetry groups and their irreducible representations.- 2.2 The origin of selection rules for interactions.- 2.3 The nature of irreducible representations of the space group.- 2.4 Symmetry criteria for the interaction of modulation components.- 2.5 Summary of the theory of short range interactions in crystals.- 3. The group theoretical description of short range order in crystals.- 3.1 Long range order and the importance of the special point vectors.- 3.2 The general characteristics of short-range order.- 3.3 The development of an energy band theory for short range order.- 3.4 The nature of interband interactions in order-disorder.- 3.5 Ordering modulations associated with an invariant point.- 3.6 The interaction between ordering and phonon bands.- 3.7 Summary of stable order modulations in crystals.- 4. Short range order interactions in incommensurate structures.- 4.1 Feldspars.- 4.2 The ordering behaviour in mullite.- 4.3 The ordering interactions in yoderite.- 5. Order-phonon modulation structures in minerals.- 5.1 The order-phonon modulated structure of potassium feldspar.- 5.2 Order-phonon interactions in modulated cordierite.- 6. Thermodynamic aspects of the occurrence of modulated structures.- 6.1 Thermodynamically stable order-modulated structures.- 6.2 Order-modulation in the mechanism of order-disorder transitions.- 7. References.- 3. Incommensurability in Two Classes of Solids: Modulated Insulators and Quasicrystalline Alloys.- 1. Introduction.- 2. Characterization of incommensurate crystals: "Standard" behaviour.- 3. Incommensurate phase transition: the "soft-mode" precursor effect.- 4. Specific dynamic properties of incommensurate phases: "phasons".- 5. Present situation concerning the static properties of incommensurate phases.- 5.1 Some examples of experimental typical phase diagrams.- 5.2 Other specific properties: global hysteresis, satellite broadening.- 5.3 Discussion.- 6. Quasicrystals.- References.- 4. Structural Phase Transitions and Specific Heat Anomalies.- 1. Introduction.- 2. Experimental methods.- 2.1 Scanning calorimetry.- 2.2 AC calorimetry.- 2.3 Adiabatic calorimetry.- 3. Reduction of background heat capacities.- 4. Application of Landau theory.- 5. Fluctuations of the order parameter and critical exponents.- 6. The influence of lattice imperfections.- 7. Order parameter coupling and excess specific heats.- 8. Coupled order parameters in feldspar.- 8.1 Na-feldspar.- 8.2 Ca-feldspar.- 9. Selected examples of structural phase transitions.- 10. Charge carrier induced structural phase transitions.- References.- 5. What Can Spin Models Tell Us About the Behaviour of Minerals?.- 1. Introduction.- 2. Universality and phase diagrams.- 3. Modulated structures.- 4. Surfaces and interfaces.- References.- 6. New Developments in Raman Spectroscopy on Structural Phase Transitions.- 1. Introduction.- 2. Theory.- 3. Applications of hard mode Raman spectroscopy.- 3.1 Displacive phase transitions and evidence for Na-K site ordering in alkali feldspar - experimental part.- 3.2 Phase transitions and order parameter treatment in feldspars.- 3.3 Phase transition in ferroelastic As2O5.- 3.4 Raman scattering of hard modes in stepwise phase transitions in Pb3(P1-xAsxO4)2.- 3.5 Sodium nitrate.- 3.6 Magnesium cordierite.- 4. Conclusions.- 5. References.- 7. Linear and Circular Birefringence and Crystal Structures.- 1. Introduction.- 2. Linear birefringence.- 2.1 Methods of measurement.- 2.2 Applications to crystals.- 3. Circular birefringence.- 3.1 Measurement and observation.- 3.2 Relationship to crystal structure.- 3.3 Calculation of optical rotation.- 4. Summary.- 5. References.- 8. Exsolution, Ordering and Structural Transformations: Systematics and Synergistics.- 1. Introduction.- 2. Isostructural decomposition.- 2.1 Introduction.- 2.2 Nucleation and growth.- 2.3 Spinodal decomposition.- 3. Atomic ordering.- 3.1 Single order parameter.- 3.2 Two order parameters.- 4. Magnetic ordering.- 4.1 Introduction.- 4.2 Miscibility gap in ferromagnetic binary systems.- 4.3 Further examples including magnetic transitions.- 5. Bicritical and tetracritical point.- 5.1 Introduction.- 5.2 Bicritical points.- 5.3 Tetracritical point.- 6. Closure.- References.- 9. Thermochemistry of Aluminium/Silicon Ordering in Feldspar Minerals.- 1. Introduction.- 2. Some general features of Al/Si ordering transitions in minerals.- 3. Macroscopic thermodynamic properties.- 3.1 Landau theory.- 3.2 Enthalpy measurements.- 3.3 Spontaneous strain.- 4. Transformation behaviour in feldspars.- 4.1 Alkali feldspars.- 4.2 Plagioclase feldspars.- 4.3 Incommensurate ordering.- 5. Kinetics.- 5.1 Disordering in potassium feldspar.- 5.2 Ordering in anorthite.- 6. Conclusions.- References.- 10. Solid State NMR Spectroscopy and Phase Transitions in Minerals.- 1. Introduction.- 2. Background theory and terminology.- 2.1 Magnetic resonance.- 2.2 Chemical shift.- 2.3 NMR of solids.- 2.4 Nuclear quadrupole resonance.- 2.5 Relaxation times.- 2.6 Fourier transform techniques.- 2.7 High resolution solid state NMR.- 3. Structural phase transitions.- 4. Displacive phase transitions.- 4.1 Displacive transitions in perovskites, ABX3.- 4.2 The Pl-Il phase transition in anorthite, CaAl2Si2O8.- 5. Orientational order-disorder transitions.- 5.1 NO2 ordering in sodium nitrite, NaNO2.- 6. Magic-angle spinning NMR.- 6.1 29Si NMR spectra.- 6.2 Empirical correlations of 29Si chemical shifts.- 6.3 29Si site assignments.- 6.4 Al, Si ordering in Mg-cordierite from 29Si NMR spectra.- 7. NMR spectra of quadrupolar nuclei.- 7.1 27A1 MAS NMR spectra.- 8. Conclusions.- References.- 11. Nonlinear Dynamics of Lattice Models for Elastic Media.- 1. Introduction.- 2. Part I - lattice model for martensitic transformations.- 2.1 The model.- 2.2 Equations of motion.- 2.3 Continuum model.- 2.4 Linear case.- 2.5 Solitary wave solutions.- 2.6 Conclusion.- 3. Part II - model for deformable lattices equipped with rotary microstructures.- 3.1 The model.- 3.2 Configuration A - equations, of motion.- 3.3 Influence of an applied field on the motion of a soliton.- 3.4 Configuration B - equations of motion.- 3.5 Conclusion.- References.- 12. Experimental Studies of Mineral Energetics.- 1. Introduction.- 2. Heat capacities, entropies and lattice vibrations.- 2.1 Basic relations and magnitudes.- 2.2 Experimental techniques.- 2.3 The interpretation of lattice heat capacities.- 3. Free energies of mineral reactions.- 3.1 General principles.- 3.2 Oxidation-reduction equilibria.- 3.3 Vapor pressure measurements.- 3.4 High pressure phase equilibria.- 4. Enthalpies of mineral reactions.- 5. 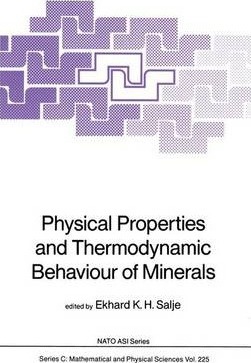 Energetics of high pressure phase transitions, with emphasis on the magnesium silicates.- 5.1 Relations between olivine, modified spinel and spinel phases.- 5.2 "Post spinel" phases.- 5.3 Lattice vibrational models for post-spinel phase transitions.- References.- 13. Heat Capacity of Solids.- 1. Introduction.- 2. Importance of the specific heat measurements.- 3. Experimental systems.- 3.1 Adiabatic calorimetry.- 3.2 AC calorimetry.- 4. Experimental results.- 4.1 Solid to solid phase transition within the Landau framework.- 4.2 Order-disorder systems.- References.- 14. Magnetic Ordering and Thermodynamics in Silicates.- 1. Introduction.- 1.1 Background.- 1.2 Properties of noninteracting ions.- 1.3 Magnetic interactions and collective behaviour.- 1.4 Cation disorder.- 1.5 Experimental methods.- 2. Magnetic order in silicates.- 2.1 Group structures.- 2.2 Chain structures.- 2.3 Sheet structures.- 2.4 Framework structures.- 3. Thermodynamic consequences.- 4. Conclusions.- References.- 15. Molecular Dynamics Simulations in the Solid State Sciences.- 1. Computer simulations.- 1.1 Introduction.- 1.2 Simulation models.- 1.3 The molecular dynamics simulation technique.- 2. Techniques.- 2.1 Technical details for molecular dynamics simulations.- 2.2 Ensembles.- 2.3 Potential models.- 2.4 Analysis of results from a simulation.- 2.5 Computers.- 3. Illustrative examples.- 3.1 Introduction.- 3.2 Orientationally disordered crystals.- 3.3 Simulations of thiourea.- 4. Conclusions: the outlook for the use of molecular dynamics simulations in minerals physics.- 4.1 General summary.- 4.2 Application in the field of minerals physics: general outlook.- References.- 16. The Computer Simulation of the Lattice Dynamics of Silicates.- S. C. Parker.- 1. Introduction.- 2. Atomistic simulation techniques.- 3. The q=0 lattice vibrations of forsterite.- 4. The crystal dynamics of forsterite.- 5. Lattice dynamics and thermodynamic properties.- 6. The thermodynamic properties of forsterite.- 7. The thermodynamic properties of the Mg2SiO4 polymorphs.- 8. Conclusion.- References.- 17. Computer Modelling of Silicates.- 1. Introduction.- 2. Aims and methodology.- 3. Interatomic potentials.- 3.1 Potential models for silicates.- 4. Applications.- 4.1 Simulation studies of zeolites.- 4.2 Defect energies in Mg2SiO4.- 5. Conclusions.- References.- 18. UV to NIR Spectra of Silicate Minerals Obtained by Micro-Scope Spectrometry and Their Use in Mineral Thermodynamics and Kinetics.- 1. Introduction.- 2. Some theoretical aspects.- 2.1 Spectroscopy.- 2.2 How does CFSE3d enter thermodynamic functions?.- 3. Methods of microscope-spectrometry.- 4. Applications.- 4.1 Cr3+, an ion with nondegenerate ground state, in garnet, clinopyroxene and kyanite.- 4.2 Mn3+, an ion with degenerate ground state, in various silicate structures.- 4.3 Fe3+-bearing point defects in fayalite, an attempt to solve a kinetic problem.- 5. Conclusions.- References.- 19. Recent Advances in the Mineralogical Applications of the 57Fe Moessbauer Effect.- 1. Introduction.- 2. Moessbauer parameters.- 2.1 Debye-Waller factor.- 2.2 Line shape.- 2.3 Full width at half maximum intensity (half width).- 2.4 Isomer shift.- 2.5 Quadrupole splitting.- 2.6 Nuclear Zeeman effect.- 3. Valence.- 4. Electron delocalization and homogeneous electronic equilibrium.- 5. Site characterization.- 5.1 Ferric ion.- 5.2 Ferrous ion.- 5.3 Next nearest neighbours interaction.- 6. Site occupancy.- 7. Magnetic properties.- 8. Cryptocrystalline and amorphous phases.- 8.1 Poorly crystalline lepidocrocite ?-FeOOH.- 8.2 Formation of an amorphous intermediate phase on dehydroxylation of akageneite ?-FeOOH.- 8.3 Silicate glasses.- 9. Diffusion studies.- 9.1 Self diffusion of ferric iron in rutile.- 9.2 Vacancy-related self diffusion in magnetite.- 10. Phase transitions.- 11. Two examples for pitfalls.- 11.1 Extraction of thermodynamic data from Moessbauerderived site occupancies.- 11.2 Ferric iron in melilite 699 References.